Thirty years after its first camp at the Mendocino Woodlands in 1981, the Bay Area American Dance and Music Week continues the long tradition at a new location.�Join us as we build and explore the evolution of our folk tradition at the Jones Gulch YMCA Camp in La Honda, California (near San Francisco), about one hour's drive from both San Francisco and San Jose airports, conveniently near Palo Alto (home of Stanford University) to the east and the scenic California coast to the west. Built in the 1930's on the site of an old lumber camp, the camp features heated cabins nestled in the redwood forest with modern bathrooms and showers. Each dormitory-style cabin houses 12 campers and inspires a tightly close-knit community. 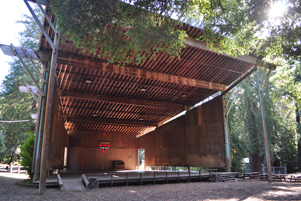 Our main dance hall is a short walk from any cabin, and has plenty of room on the floor for everyone. 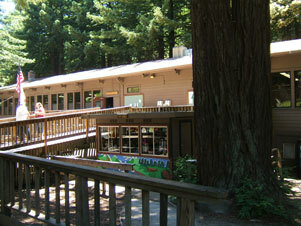 The dining hall, the former logging mill, is the location for our meals as well as additional dance sessions. 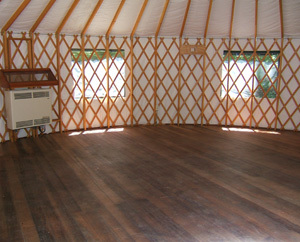 A unique 35-foot wide yurt with beautiful wood floor is a third main venue for dance and music sessions. Meals are prepared by culinary institute-trained chef and staff. Well maintained and well-lit trails connect the clusters of cabins, dance lodge, and dining hall. 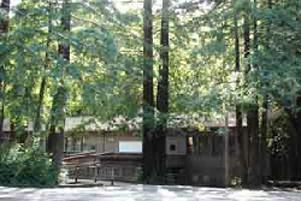 The many buildings and forest provide numerous nooks and niches for jamming, chatting, reading and relaxing. Returning Program Director Laura Light has assembled an outstanding collection of teachers and musicians for the uniquely wondrous experience that is dance camp. Our staff represent a wide variety of styles, and bring their experience and expertise to create amazing opportunities for enrichment and enjoyment. We welcome the return of familiar faces and celebrate meeting new friends. Special dances and events featuring camp staff are scheduled both before and after camp. Come early before camp, and stay longer after camp, for an extra dose of fun! The organizers and staff of American Dance and Music Week invite you to share great food, laughter galore, amazing stories and songs, and top-notch dancing and music. From dance workshops to music sessions to singing and handicrafts, from scheduled classes to impromptu sessions to camper-led activities, from non-stop dance and music to gourmet food to peaceful rest and contemplation in the redwoods, we have the ingredients to create some of your future favorite memories. There were many memorable moments – dancing to fantastic music, mingling with great people, eating the most amazing food, and hiking through the beautiful forest. It happened several times but it was basically the same each time: realizing that the wall of sound I was dancing to was beyond compare, and it was resonating in every cell of my body.